Mace spray easily fits into a purse or small bag and can be pulled out at a moment's notice. Mace Leather Plus Pepper Spray - Attractive model fits easily in pocket or purse. Leather carrying case. Features glow-in-the-dark locking safety cap and keychain. 15-gram unit sprays up to 10 feet. Contains 5 one second bursts. The 10% Peppergard formula contains a 0.66% capsaicinoids concentration. The OC pepper formula creates an intense burning sensation to the skin, eyes and throat, and causes an attacker's eyes to slam shut upon direct contact. Peppergard also contains an invisible UV dye, which marks the assailant and may aid in identification. The Mace 10% PepperGard Leather Plus Model comes in an attractive leather-like pouch that has a snap closure and key ring, so it's convenient to carry. The glow in the dark locking safety cap makes it easy to use, even in the dark! 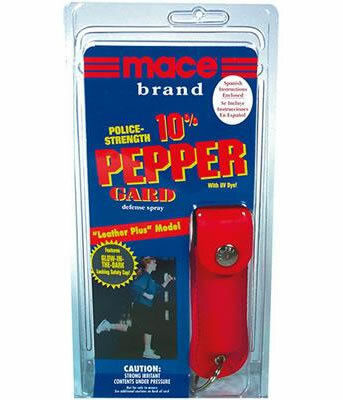 Mace pepper spray is a popular self defense product today. Although regulations on this spray can vary in each state, it is allowed in most areas, unlike other self-defense products. There are many benefits of carrying a defensive spray, and these are the main reasons why it's a good idea to carry around this product. The first reason is that it is convenient, small, and discreet. For women, mace spray easily fits into a purse or small bag and can be pulled out in a moment's notice. Guys can carry it in their pockets easily. Some types of sprays come with a discreet keychain as well. For someone who wants to protect themselves, but not advertise that they're carrying pepper spray, this is a great option since most people won't even notice that you have it. Mace pepper spray is extremely effective but non-lethal. Some of the recommended self-defense measures available may not be allowed in some areas, but pepper sprays are generally permissible. It is also one of the best ways to stop an attacker in his or her tracks. When sprayed in the general direction of the eyes, it immediately incapacitates a person, allowing their intended victim to escape unharmed. While being extremely effective, it will not do any permanent damage. This is a benefit for anyone who may use it in an enclosed space and end up getting some in their eyes. One of the biggest obstacles that people have to carrying one of these is that they will accidentally use it on themselves or that the spray will be too weak to reach their attacker. The good news is that companies have worked to improve the range of the pepper spray and have also been extremely careful to label the spray to avoid people spraying themselves. When you purchase one, be sure to read the directions for best results. However, it is fairly difficult for people to spray themselves even accidentally, and this rarely happens today. One final benefit of having mace pepper spray is that it allows people to be more confident and empowered in their daily lives. If you live or travel through an area that is known for being dangerous, you may feel stress and anxiety every day. However, by having the pepper spray as a preventative measure, you don't have to experience the same amount of anxiety and fear. For people who want to live their daily lives with as little stress as possible, this is a huge benefit to them. Chances are, you may never need to use the spray, but having it will keep you confident in the knowledge that you'll be able to defend yourself if necessary. These are the main benefits of having mace pepper spray on hand. Carrying this spray on a keychain, in your pocket, or in a purse is one of the best ways to ensure your safety at all times. I will order from this company again.....got my order quickly and there was something wrong with my case and it was replaced and received that one timely as well.